✦ Dynamic and static blood pressure, heart rate, blood oxygen. ✦ BT connection, support Android 4.4 + and iOS 8.0 + mobile phones. ✦ Pedometer, calories, distance, find Phone, sleep measurement, Call / SMS reminder, alarm clock alert. ✦ Real-time mobile-side synchronization information function, message push up from QQ, Wechat, Facebook reminder. ★★ 1,Before connecting the phone, Bluetooth must be turned on. diagnose blood pressure and blood oxygen. If necessary, consult a professional. ★ 1, Q: What app does the watch use? A: Fitcloud. If you need an electronic manual, please contact customer service. In each product received, there will be a contact information for contacting customer service. ★ 2, About the charging line: Our products contain charging cable, if your charging cable is broken or not inside the package, you can search for ASIN: "B07DCNTCPR" to buy it, or contact Hangang customer service, they will solve the problem for you. 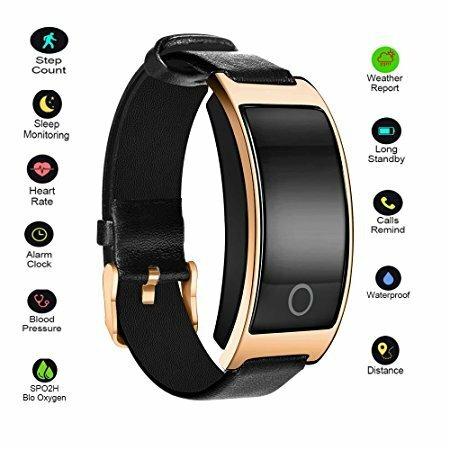 ★ 3, About the function of the watch: Heart rate monitoring, blood pressure, SPO2H oxygen, pedometer, calories record, sleep quality monitoring, sync date and time, notifications, anti-lost alert, find Phone, sedentary alert, etc. heart rate and blood pressure The function, we are not professional medical equipment, can not detect the same value as professional blood pressure meter, heart rate meter, etc. If there are special requirements for this function, please buy carefully. ★ 4, About the issue of monitoring sleep and watch time: monitoring sleep function is monitored on the mobile phone APP, there is a fixed value, the sleep monitoring function will be automatically started every night from 11:00 to 7:00. How to set the watch time? The time on the watch is synchronized with the time on the phone, just turn on the time synchronization function on the app.